Property buyers sometimes appoint us or another third party as their power of attorney in Turkey. This is typically done when buyers are unable to travel for the procedure to be carried out including military checks as well as signing and registration of the title deeds. Authorizing a power of attorney (POA) takes two hours and is witnessed at any notary office within Turkey. Foreigners who don’t know turkish will need to use a certified translator, registered with the notary office. When you hand POA to someone, you are effectively saying by law "You may act on behalf of me for these powers," so it is advisable to only give power of attorney to professional estate agents or registered and certified solicitors. A power of attorney should only contain a power for necessary procedures and nothing else. This typically includes a power to buy property on your behalf as well as obtain electric and water connection. Avoid general power of attorney because this gives the other party approval to sell a property or take on debt, and in the wrong hands, it could have disastrous consequences. 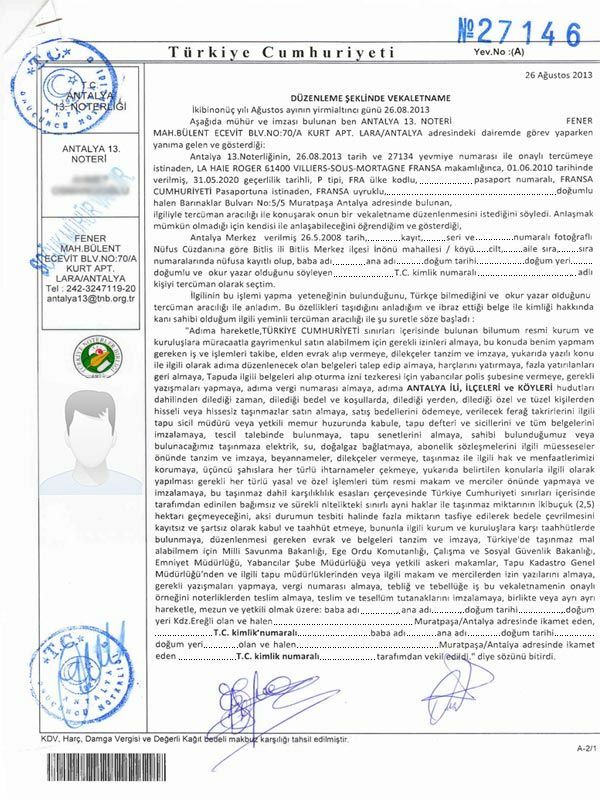 The below is an example of a power of attorney in Turkey that authorizes Doomoos to buy property in Turkey and get water and electric connection on your behalf. I, the undersigned representative of ANTALYA 13th NOTARY PUBLIC AHMET O.............., authorized signatory Head Clerk NAMIK DAVASCAN, was approached by (CUSTOMER NAME) while carrying out my duties at FENER MAH. BÜLENT ECEVİT BULVARI, NO: 70/A KURT APT., LARA / ANTALYA, who presented his / her (................... details of identification presented.........................), who verbally requested through a translator that a power of attorney be prepared. As it was not possible to communicate with him / her, I selected the authorized translator of our notary public ALİ VAHİT VEYSİ, who I knew would be able to communicate with him / her to act as interpreter. I learned through the interpreter that the relevant person possessed the required authority to undertake the said procedure, that he / she did not speak Turkish, but that he / she was literate. He / she made the following request through the said authorized translator, who I knew to possess the necessary skills, and evidence of whose identity was presented to me in the form of his identity documents. To make the necessary applications to the various organizations and authorities in order to obtain the required permissions so that I may be able to purchase land and property within the boundaries of the Republic of Turkey. To track all of the procedures I would need to track on this matter; to present and collect documents in person; to prepare and sign petitions; to request and collect any documentation to be prepared in my name on the above stated matter; to pay all duties, and receive back any which have been overpaid. To collect the necessary documents from the Land Registry and present them to the foreign nationals branch of the police in order to obtain a Residency permit; to undertake the necessary written communication; to obtain a taxation number in my name; to purchase any land or property within the boundaries of any of the districts and villages of the province of ANTALYA, at any time he wishes, for whatever price, under whatever conditions, at whatever location, and from whosoever - whether it be private individuals or legal entities - he wishes. To pay the purchase price; to accept any assignments to be made in the presence of the relevant land registry director or authorised officer; to sign the title book and records and all documents; to request registration; to collect the title deeds; to make arrangements for electricity, water and natural gas to be connected to the property he is to purchase; to prepare and sign the contracts for these in the presence of the necessary authorities. To make declarations and submit petitions; to protect my interests and rights with regard to this property; to send all types of warnings to third parties; to carry out all of the required legal and other procedures in connection with the above stated matters, in the presence of all official organisations and authorities, and to sign them. To give undertakings to the necessary authorities and organisations, that under the principles of reciprocity, the independent and permanent limited real rights over properties which I will procure within the boundaries of the Republic of Turkey will not exceed 2.5 (two and a half) hectares, and that should it be determined as otherwise, I unconditionally accept and undertake that the excess properties be sold in return for cash. To prepare and sign any documents necessary in this respect; to obtain the necessary written permissions from the Ministry of Defence or the authorised military organisations, the Land Registry General Directorate and relevant Land Registry Directorates or the relevant organisations and authorities, in order that I may obtain property within Turkey; to undertake all of the necessary written communication; and to make and accept declarations." The written statement has been read by the interpreter to the relevant party. The relevant person declared through the interpreter that what was written on the statement is in accordance with his / her wishes, and the statement has been signed by the relevant person, the authorized translator, and by myself. The twenty-first day of the month of February in the year two thousand and twelve 21.02.2012. DECLARATION BY THE INTERPRETER: I have communicated the wishes of the relevant party who speaks ENGLISH to the notary public. I have translated the above statement written by the notary to the relevant party. He / she has stated that the above is in accordance with his / her true wishes. And I hereby declare that the relevant party has accepted this statement and signed it in my presence. • Four reasons to choose Turkey when investing in real estate. • Additional expenses to pay when buying a turkish home.